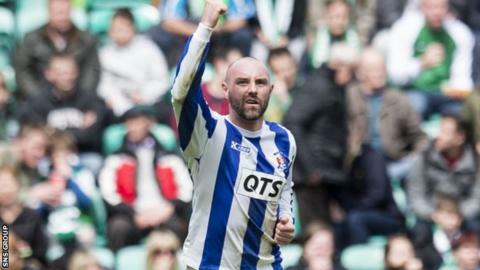 Kilmarnock striker Kris Boyd is to undergo an ankle operation, having played with the problem for two months. The 30-year-old Scotland international had been unable to fully train in preparation for matches. However, he insisted on delaying surgery until Killie had ensured their top flight safety. And Boyd scored his 22nd goal of the season on Saturday in the 1-0 win at Hibernian that helped secure a ninth-place finish for the Ayrshire side. The former Rangers and Middlesbrough striker was also on target in the preceding 1-0 victory over St Mirren, which lifted the Rugby Park side out of the relegation play-off spot. Boyd is out of contract this summer and there has been much speculation over his future, with a return to Ibrox being widely forecast. However, Kilmarnock boss Allan Johnston is keen to hold on to his top scorer and that was backed up by chairman Michael Johnston and fellow director Billy Bowie expressing their desire to keep him after the win at Easter Road. Boyd, who was shortlisted for the PFA Scotland player of the year, will have the operation on Thursday and will be fit and ready to participate in pre-season training after a summer holiday.